Throughout history many have said that you cannot truly know where your future lays if you do not know your past. That is why we feel it of the utmost important to review famous Kentucky Derby winners over the past 140 years of the coveted horse racing tradition. The Kentucky Derby tends to produce a variety of horses that have memorable names. 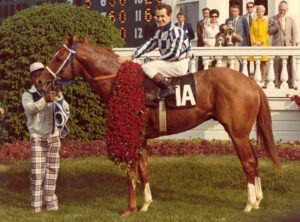 The most talked about Derby winner is probably Secretariat considering that the thoroughbred had a Disney movie produced about him. In 2012, I’ll Have Another became a popular horse due to the fact that crowds of beer drinkers who were in the infield of Churchill Downs were betting on the 12/1 long shot based on its name alone. Imagine their surprise when they were able to cash that winning ticket. One of the more legendary Kentucky Derby Winners is Charismatic. This horse won the Kentucky Derby on long odds and went on to enjoy victory at the Preakness in 1999. Charismatic was denied the Triple Crown at the Belmont. Immediately after the race, Charismatic had to have leg surgery. Some believe that the length of the Belmont Stakes caused too much stress on the horse however the horse went on to win several awards that year. Just a reminder that the 2014 Kentucky Derby will be raced on Saturday May 3rd 2014 at Churchill downs and although there are only pool odds being offered for Kentucky Derby betting you can still lay your bets down at most online racebooks. War Admiral was the horse to beat in 1937. The Triple Crown winner won the Derby by 8 lengths and was undefeated though out the entire year. War Admiral started 26 races and won 21 of them. War Admiral only raced once without getting a win, place or show.